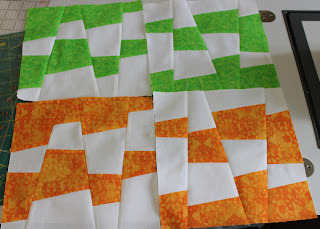 I had cut them out and sewn one ready for the virtual quilt, but never got around to emailing it to Sophie. A few days later I made up the second one. I’d also cut out the squares ready to make two more. In the mean time, several people had posted the strip method of sewing the blocks, rather than squares so I thought I’d give that a go. Today my house guests left and I had a few minutes to myself so I figured I’d better get on with them. Halfway through my second round of cutting I discovered my error….. I decided to make the blocks up anyway as I still think they look rather funky. So now I have my first true orphan blocks. Now I need to decide if I’ll make more to match and actually do something with them, or just use them as they are and make something small. So that’s only one pair for me so far. I might try and remake the others before the end of the month, but I have a few other priorities first. I like these blooper blocks and it SO re-assuring when you know you're not the only one that loses the plot sometimes! I nearly have a lap quilt of Block Lotto Bloopers!! Your Oopsy blocks are interesting … and now we all know what the answer is to "what if …" I swapped the rowswith the other half of the pair of blocks. I added the single pair to the list. I agree — the blooper blocks are cool!